Published on August 28, 2011 by Wade Shepard Follow me on Twitter here. By anybody’s standards, transportation in Iceland is expensive. As this is an extreme budget travel guide, the best information that I can provide on this country’s transportation network is to avoid it at all costs. The price for an hour on a bus runs over $15, which is extremely expensive on a global scale. Ride a bicycle or hitchhike in Iceland, don’t get on those buses. But if you must take the bus, there is a decent network that covers most of the roads that are graded for bus transport in the summer. In the winter, many routes are shut down. Between May and September buses go to and from Reykjavik at least twice a day from most locations in the country and stop at most population centers en route. Make sure you pick up a bus scedule upon landing in Iceland, as these buses do not just leave all day long from most places in the country. 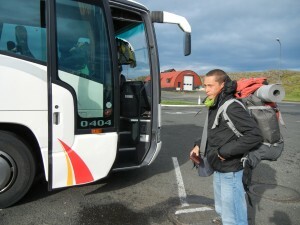 If you plan on doing heavy travel by bus in Iceland, getting a bus pass may be a good option. A Full Circle Pass — where you can go all the way around Ring Road getting off wherever you want — is available through TREK for 23,800 kr. To add the Westfjords into this you are looking at 35,300 kr. Rekjavik Excursions also has a variety of bus pass options for a few hundred bucks each. While an Omnibus Passport will get you unlimited trips an all bus routes minus those that go through the interior for one week to a month. The prices for this range from $500 to a thousand dollars. Flying to somewhat distant destinations around Iceland is often cheaper than traveling by bus. Expect to pay $100 to get across the country. Air Iceland, Iceland Air, and Iceland Express are some domestic airlines that fly around the country. Hitchhiking is an excellent way to get around Iceland. It is as safe as it can be, where there is traffic the rides are easy to get, and it is a very common way for tourists to get around the country. Go to the Hitchhiking in Iceland guide for more on this. There are no long distance train lines in Iceland. Renting a car seems to be a popular option for many tourists in Iceland not prepared to drop a grand on the buses or ride a bicycle. Cars can be rented in Iceland for as little as $80 a day — truly not a bad option of you’re traveling with three or four other people. 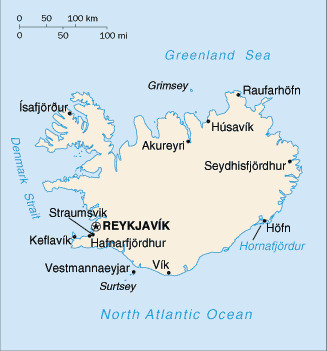 Iceland has a ferry system that connects Stykkishholmur with the Westfjords and Tþorlákshöfn with the Westman Islands. Next post: Digital Nomad or Economic Refugee?